I think you’ll love this month’s round up of books! 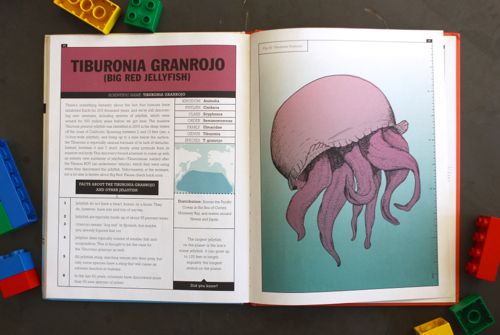 There are knock out illustrations, really good stories, and a non-fiction selection as well. 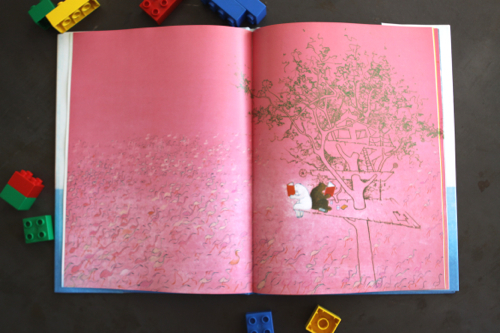 First up, let’s talk about The Tree House, by Marije and Ronald Tolman. 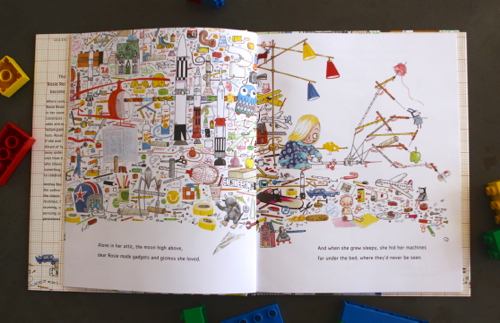 This is a wordless book — which means the images have to work even harder. But they totally do! 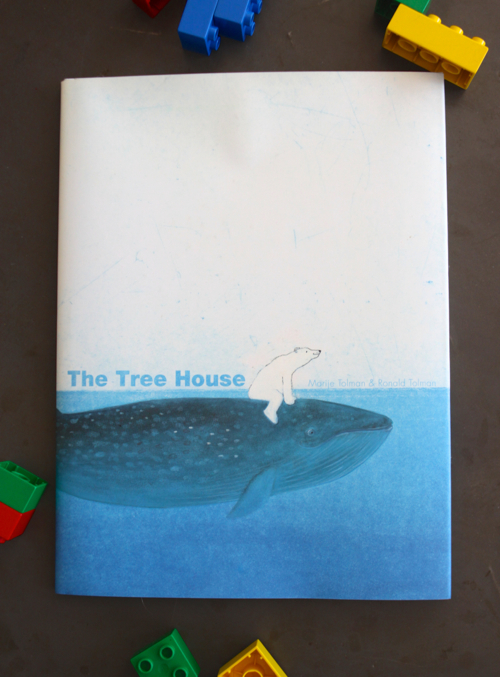 A polar bear rides a whale to a tree that’s growing out of the water. How’s that for a magical opener? And it just gets more fabulous from there. Polar Bear isn’t alone for long — as the water recedes, more and more animals join him. Some by land, some by air. Your kids will want to study every image. Remember Iggy Peck, Architect? 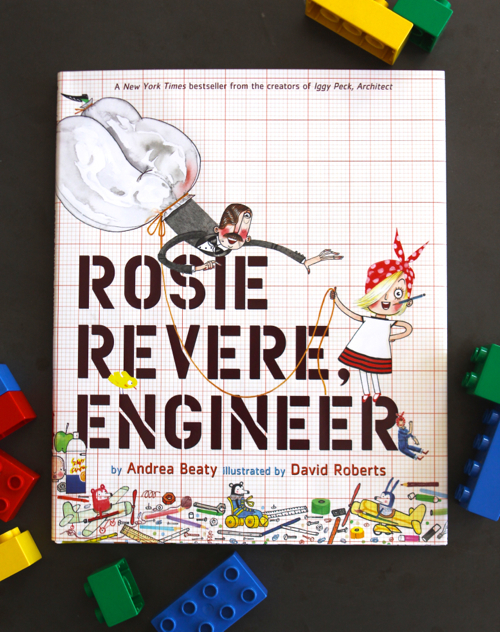 Well, today I’m happy to introduce you to Rosie Revere, Engineer. It’s written by Andrea Beaty, with gloriously detailed illustrations by David Roberts. Jessie Arora, the founder of Embark Labs, sent me this book to welcome our family to the Bay Area. Such a sweet gift! 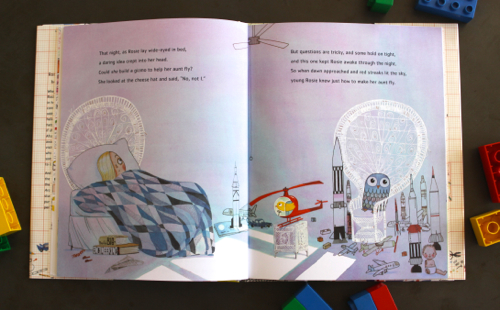 Though Rosie may seem a bit quiet during the day, her nights are filled with visions of inventions. Not every invention is a hit, and Rosie is tempted to give up her dream of becoming an engineer. But maybe her invention “flops” aren’t as bad as they seem. The whole book is written in memorable rhyme, and the message of the book is so encouraging, it appeals to kids and adults alike. Next up is The Great Brain, written by John D. Fitzgerald. 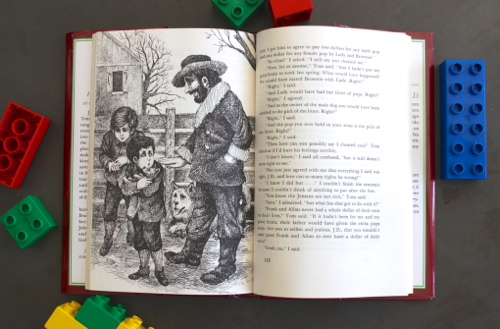 This is a chapter book, not a picture book (though it happens to feature some memorable illustrations by the legendary Mercer Mayer). We’ve been reading this book as a family this summer and it’s been a huge hit. Ben Blair and I read this as kids and we both remember it fondly, but I swear, it’s even more fun to read as an adult — because as a kid, I think I missed a decent chunk of the humor. I know I don’t typically feature chapter books, but if you’re looking for something fun to read as a family, this gets a big thumbs up. I should note: this is actually a series, so if you like the first, you can find the rest here. 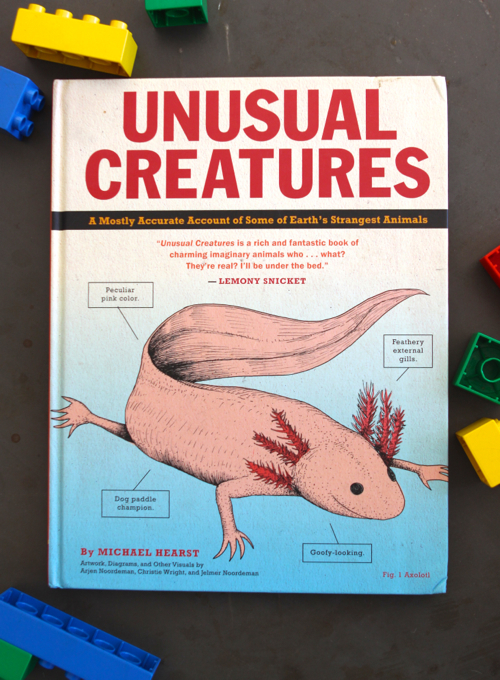 And then we have Unusual Creatures, written by Michael Hearst, with illustrations by Arjen Noordeman. My son Oscar basically loves any non-fiction book about animals, and this book is certainly on his approved list. He keeps it by his bed and references it often. 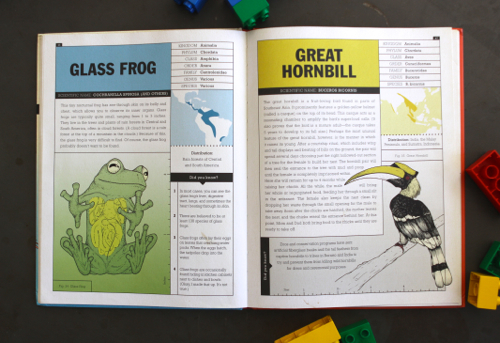 The book features facts and descriptions of real live creatures most people haven’t heard of (raising my hand here), and the whole thing is written with a lot of wit, so it ends up being informational plus fun. Your turn! What are your kids reading these days? Are there any books on your shopping list or library list that you’d like to share? We’re always on the hunt for great picture books! We’re going to have to take these out from the library ASAP! Thank you Gabrielle for your suggestions. 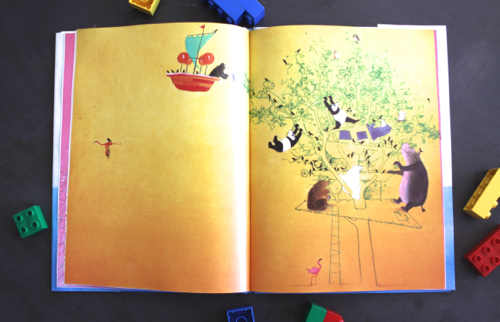 We have a huge collection of picture books but it is always interesting to discover new books. I happened across The Tree House a few years ago at our library and we have checked it out multiple times since. A beautiful book! My son & I have enjoyed The Great Brain as well. These look lovely! Will take a look, we have a list also – and constantly adding to it, so thanks for this post. Wow, I was just thinking about The Great Brain this morning! I loved this series as a kid and am looking forward to my own girls reading them. I like the looks of Unusual Creatures! We are reading Nature Anatomy by Julia Rothman (there’s a review on my blog) and books by David Macaulay. Thank you for this list! I just requested two of the books from the library. I remember reading The Great Brain as a child and completely forgot about it. I hope my kids love it! I just read “Blueberries to Sal” with her for the first time and we loved it. I would love to take her berry picking and have never been myself. We have “Make Way for Ducklings” and its definitely a favorite. We love Rosie Revere! 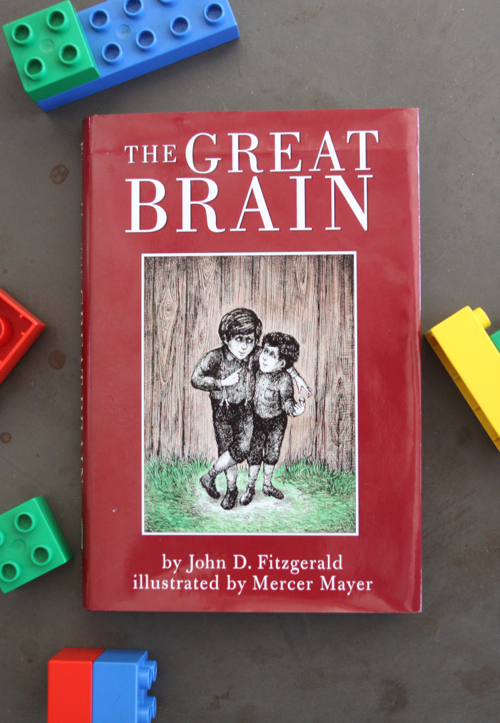 And of course I remember Great Brain from my own childhood – thank you for the reminder! My two (2 & 4) have just discovered Madeleine and Olivia – we are reading those on repeat. My 4 year old loves Frog & Toad, too. Also, I Love You Stinky Face.